Build your own 1/12th Scale Sport Hydro. We recruited Larry to write this article for Rum Runner Racing following his successes at the 1999 NAMBA Fast Electric Nationals. Larry raced his 1/12th scale sport hydro and set a new 4 lap speed record of 50:47 seconds. Larry built his boat from RCBM plans. Larry constructed his boat from balsa and plywood. The boat looked marvelous and performed even better. The bottom line is, anyone can enter Fast Electric Boat racing. Even if you are on a tight budget or prefer to build your boats from scratch. Rum Runner recommends the Dave Frank Design. We are convinced that anyone can build this 1/12th scale hydro for under $50.00US (not including hardware, motor and electronics') and be a winner. Thanks Larry for contributing. The Dave Frank O Boy Oberto 1/12th sport scale hydro is one of the fastest P Sport boat designs available today. The interesting thing about this hull is that it is not available from any manufacturer. You have to scratch build it yourself. Perhaps in the future someone will build this hull from epoxy or carbon fiber. This boat is constructed of balsa and light ply and is a fairly simple hull to construct. I recommend that you purchase the construction video along with the plans. The designer will show you step by step how to build your own winning boat. The hull is the brain child of Dave Frank. Dave is a gentleman who was prominent in fast electric racing in the early 90’s. He has since retired from fast electric racing and I believe still lives in the Washington State area. His hull designs were on the cutting edge at the time and as I can attest are still a winning combination today. The basic design of the 1/12 sport scale O Boy Oberto was pulled from his own 1/16 scale design. From this he made it larger, made some modifications to the sponsons and with a lot of research and development it evolved into the hull I use today. The boat is 28 1/4 inches long and 13 3/4 inches wide. This hull is very stable and extremely good in the corners. The hull held many records in the APBA and if compared to the NAMBA records some of them would still stand today. Actual construction of the boat is easy. The building plans are full size and has full size part templates that you cut out. These templates are then positioned on each piece of wood. You simply cut them out with a blade. This makes the part construction virtually error free. The rest of the pre-construction is simply a matter of cutting out predetermined sizes of light ply. What really makes the construction of this hull easy is that Dave made a wonderful construction video in which he takes you step by step through the construction process. The plans are very detailed and if followed through completely, you will have a fail safe method for construction. You will see that the sponsons are each different. So you must follow the plans, exactly. The right side and left side are completely different and if the plans are not followed it will give you less than desired results and performance. Total materials cost was roughly $50.00 and the time to construct is variable depending on how much time you have to donate to the project. I constructed mine over the winter months at my leisure. The Dave Frank O Boy Oberto design is definitely designed for speed with 12.5 second lap times and a 4 lap time at 50 seconds. Combined with minimal cost of construction this a hard combination to beat. Set-up and hardware. The Plans show the boat set-up with a dual motor Hughey Gear drive and Hughey Hardware. This is a very successful combination and no doubt a fast way to go. I decided to vary from the plans and use an Aveox 1412 1 1/2y for my boat. I just like the Aveox motor and use them in most of my boats that are 12 cells or above. Then I choose Fuller Fast Electric’s hydro hardware for my boat. I followed the set-up and rigging instructions exactly as Dave Frank suggests. Be careful to get the balance points correct. This will make a big difference with your boats performance. Set-up and Hardware used by Larry. Running Hardware: Fuller’s Hydro Running Hardware Kit. Price: $90.00. Ordering supplies on-line for your 1/12th Scale Sport Hydro. 3. Power. The Dual Hughey gear drive can be purchased from Fuller’s Fast Electric’s. In the event you are seeking the Aveox motor and controller, Rum Runner recommends; Rogell R/C Marine or Fuller’s. 5. Batteries. For racing, you will want professionally matched batteries. Rum Runner uses select batteries from Fuller’s Fast Electric, Superior Hobbies, or Fine Design Manufacturing. Fine will soon be on-line for ordering. Would you like to race Larry and his homemade 1/12th Scale Hydro? Larry will be at the Spring Splash race in Seattle, Washington. The race will be held on June 9, 10 and 11, 2000. Register today. Click Here. Larry invites you to join a Fast Electric R/C boating organization. Why be left out. Join in the fun. 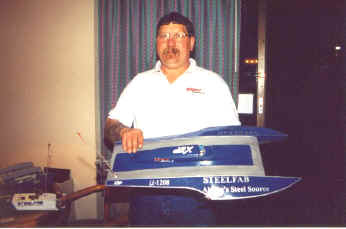 Larry is a member of NAMBA (The North American Model Boat Association). The leading organization for oval fast electric racing. This article was written exclusively for Rum Runner Racing by Larry Larson. Use of this article is strictly prohibited without the prior written permission of Rum Runner Racing.